Meet the 2016 Dodge Challenger a very modern car with a very retro look and name. In the days of electronic capabilities, it certainly can be a trip down memory lane. The Challenger mixes just the right amount of style, dependability and consistency while staying true to its storied past. This vehicle is larger than any of its competition both physically and in reputation. For 2016 there are 10 models available in the lineup. The choices for power-train are many on the Challenger with lots of room to get more of an exact type of engine and system that you want based on what you are needing the vehicle to do. Starting the choices off there is a 3.6-liter V-6 producing 305 horsepower and 268 lb.-ft. of torque. This setup gets 19 miles when driving in the city and 30 miles per gallon on the highway. Moving up the list there is a 5.7-liter HEMI V-8 in either an automatic or manual transmission unleashing 375 horsepower and 410 lb.-ft. of torque. This engine gets 16 miles per gallon city and 25 miles per gallon on the highway while the manual transmission gets just a negligible amount of difference. The next choice is a 6.4-liter HEMI V-8 with 485 horsepower and 475 lb.-ft. of torque. This engine gets 15 miles per gallon city and 25 miles per gallon on the highway. The last but most definitely not least is the 6.2-liter supercharged HEMI V-8 capable of a magnificent 707 horsepower and 650 lb.-ft. of torque. Miles per gallon comes in at 13 miles per gallon city and 22 miles per gallon highway with both transmissions. 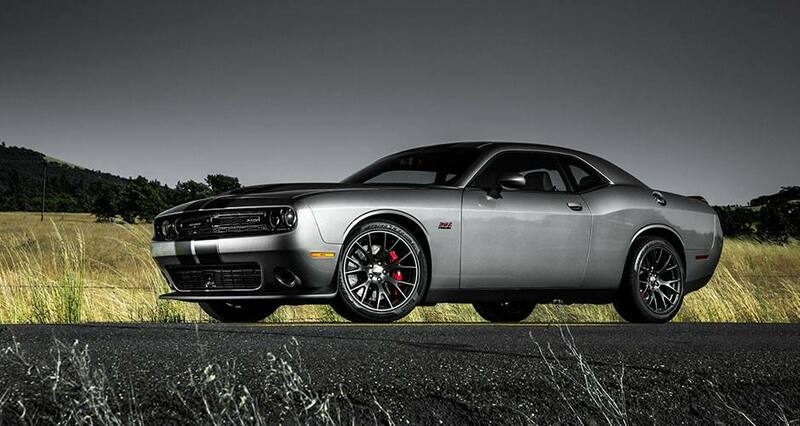 The Dodge Challenger has an unmistakable look. The designers took this year's model and gave a look of times gone by with the classic Coke bottle shape and links to decades a long time gone. 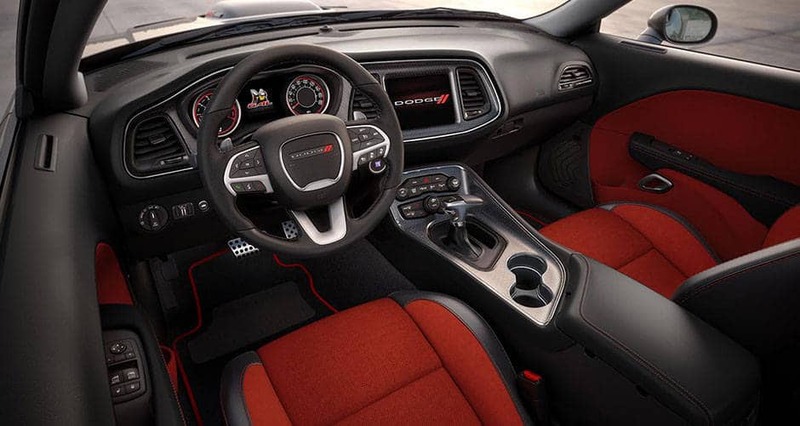 The Challenger has a short deck and an elongated hood and the SRT model has a cold air intake hood scoop which are the types of things that help make the vehicle what it is today. They have also taken additional steps with the retro look and added classic colors for selection as well as classic exterior detailing like the racing stripes and lines that some folks grew up with. With all of this under consideration there is also assurance that when it gets down to it while the exterior takes inspiration from previous times the interior and the mechanics are most certainly a modern and ground breaking composition. The interior is spacious, functional and welcoming complete with a touchscreen display. The backseat is also very roomy and three people are able to fit back there which is a leader amongst muscle cars. The trunk is also very large with plenty of room for cargo. There are twelve wheel options, fourteen interior options, twelve options for wheels, a great deal of exterior detailing choices and many modern and classic exterior colors to help make your Challenger yours. With so many options the ability to create and customize your own is at the forefront where as you don't have to have the same vehicle as your neighbor the family down the street. Can you help me find financing for my 2016 Dodge Challenger? The Dodge Challenger is a vehicle that is sold on such things as capability, power and handling and you may not think that it is up to snuff in the safety department but you would be wrong. The Challenger comes with many passive and active safety measures designed specifically with the intention of keeping you and yours safe and secure and giving you the best riding experience possible. There is: front knee air bags, active head restraints, anti-lock brakes, seat-mounted side pelvic-thorax bags, Hill-Start Assist, Adaptive Cruise Control and many more. Federal government ratings give this year's Challenger a five-star rating which is tops. 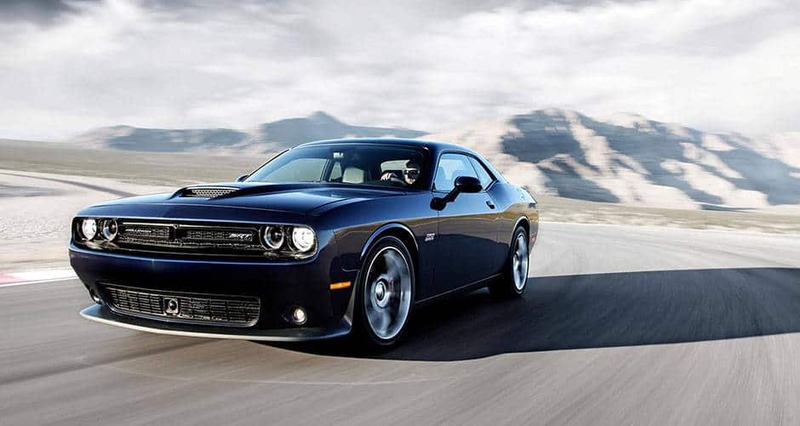 The Challenger is a widely recognized American icon and is certainly the right car for you. Come on down to the show room or give us a call to schedule a test drive today.